I recently heard in "Veda parichaya" in a local channel that the sounds of the alphabet(Sanskrit) originated from Lord Shiva’s ‘damru’. 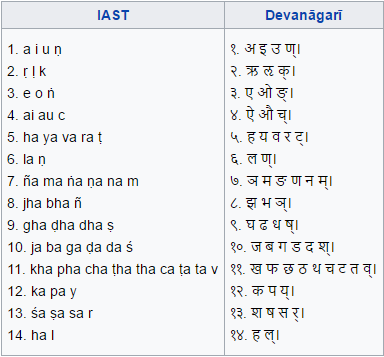 Can anyone elaborate on these sounds and their relation to Sanskrit. In all of Panini's grammar, there are a set of sUtras(सूत्राणि) or formulae, which represent particular rules, and in those rules, the above सूत्राणि are the basis. As a simple example, the सूत्रम् for यण् सन्धि (yan-sandhi) is 'इकोयणचि', expanded as 'इको यण् अचि'. This means then इकः meets अच्, the result is यण्. इकः : this is comprised of letters 'इ उ ऋ ऌ' as obtained from the first and second sUtras (note the first and last letters are used to represent the range). For example, इति + अपि = इत्यपि is a यण् सन्धि where 'इ + अ = य' is the fundamental operation from the vowels in the ends of the words. Panini did not create Sanskrit or the grammar of Sanskrit. The language existed and was in use, and had a grammar before his. However his grammar is one of the systematic ones. Hence we can see some works predating Panini where there are slight deviations from his grammar. Those deviations are considered okay and acceptable. It is a legend that संस्कृतम् is गीर्वाणभारती, i.e., language of the Gods. Hence, even a डमरु of the high Gods makes sounds in संस्कृतम्. The word संस्कृतम् literally means 'correctly/nicely/well done' (सम्यक् कृतम्). The legend does not imply that Shiva created the Sanskrit language, only that संस्कृतम् is the commonly spoken language of the Gods. Even if Indra had descended to Panini, he would have likely spoken in Sanskrit. Needless to say Panini became a well enlightened and learned man after that! Same events happen in different ways. i.e, Lord Shiva indeed played Damru to emanate Sanskrit letters but that was happened during creation as well in different way. From the commentary of Kshemeraj on Shiv Sutra on 2.7, we find. According to the process described in Paratrimsaka etc. the first aspect (spanda) of anuttarasakti is the Supreme I-Consciousness which assumes the form of akula i.e. that of which the body (kula) is 'a' (अ). (This 'a' is the expression of Cit-sakti of Siva). As there is further expansion of the world manifesting-power of aham or I-consciousness, ananda sakti (bliss) comes into play which assumes the form of the letter 'a'(आ), then bringing forward iccha sakti (will power), that I consciousness displays 'i'(इ) in the aksubdha state of iccha and i(ई) in its ksubdha state which is an expression of isana or isitri (the power of mastery); then with jhana sakti in its aksubdha state, she displays unmesa (knowledge) which is represented by the letter 'u'(उ) and in the ksubdha state of jnana sakti displays unata (deficiency in jnana as mere jnana) which becomes the cause of objective appearance. This is represented by the letter 'u' (ऊ). The previously mentioned anuttara i.e. the letter 'a' . and ananda i.e. the letter 'aa' combining with 'i' of iccha form the triangular ae (ए) vowel. With the combination of anuttara (i.e. the letter .) ananda (i.e. the letter ) and unmesa (i.e. the letter there is the formation of the letter 'o'(ओ) which denotes the inclusion of kriya sakti. With the combination of the previously mentioned two letters (i.e. with or + there is the formation of the hexagonal letter ऐ - and with the combination of 'a' or 'a' and 'o' there is the formation of the trident 'au'(औ). In the formation of the letter there is the union of all the three saktis viz, iccha, jnana and kriya with the predominance of kriya in its clearest form. Then the Supreme I-consciousness expresses the undivided knowledge of the universe in the form of a dot (bindu) in the letter 'am' अं. It shows further the visarga stage in the form of two (perpendicular) dots indicating simultaneously inner and outer manifestation. अः Thus the creative I in its inner awareness shows the entire panorama of manifestation only as resting within the anuttara state and from the standpoint of outer awareness exhibits the expansion of a group of five tattvas in each group of five letters, through a, i, u, r, i l Saktis. Each group of five letters from ka to ma expresses tattvav from prthivi upto purusa. It continues till the creation of universe. 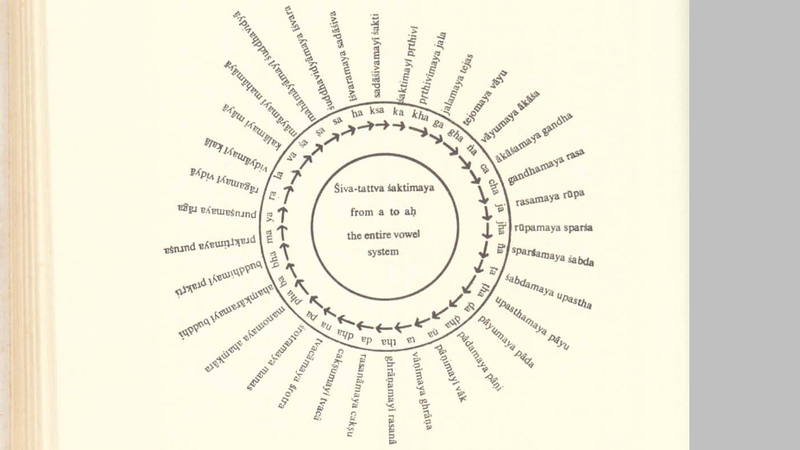 i.e, In short each Sanskrit alphabet corresponds to creation phase. Lord Shiva being the originator of Sanskrit alphabets also mean he created the world (Injustice?). Also, note that, creation follows as a checkpoint which we call tattvas as I explained in this answer. 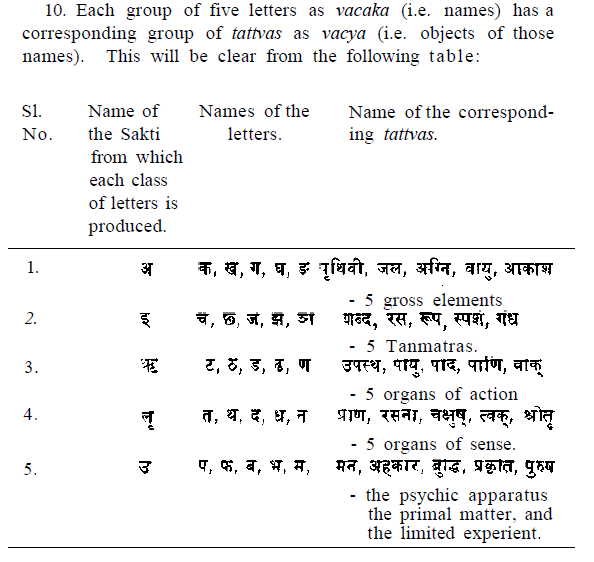 There are 36 tattvas takes part in course of creation & thus all sanskrit alphabets comes into existence with each such tattvas as shown in the pic. Not the answer you're looking for? Browse other questions tagged shiva sanskrit etymology . Is Sanskrit considered divine language to those of the Hindu faith? Which was developed first, Sanskrit or Vedas? How ॐ (OM) is written in Brahmi Script?